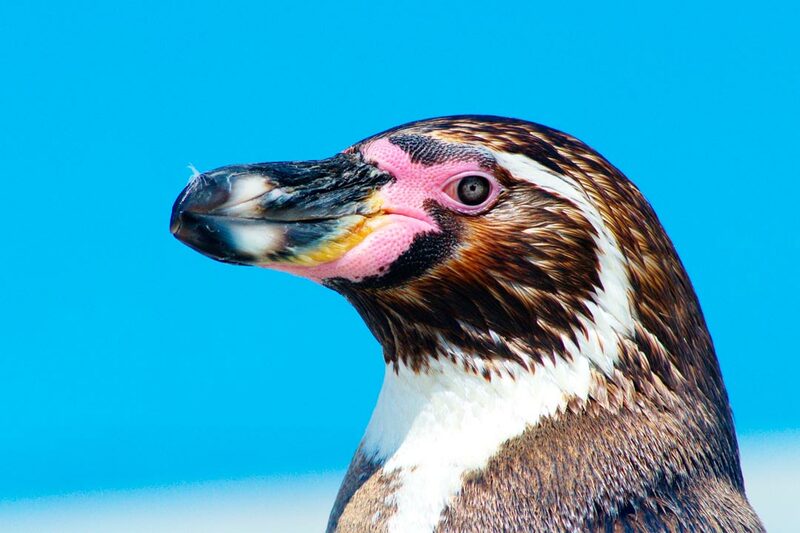 Penguins belong to a group of birds that cannot fly; their wings are adapted for swimming. For this reason, people used to think of them as fish. All penguins belong to the same family: Spheniscidae. The penguin’s original name comes from a bird native to the North Atlantic islands which became extinct in 1844, but was not related to the southern penguins. They have a light-coloured belly and a dark-coloured back for camouflage; they blend in with the sunlight above or the darkness of the ocean depths below. They walk upright on dry land and are quite clumsy, waddling around with outstretched wings to keep their balance. They have 4 toes on each foot: The 3 front ones are webbed together by an interdigital membrane, while a small, separate toe points backwards. They are covered in feathers; their body feathers are reduced in size and look like scales, their tail feathers are modified and are used as a rudder for navigation and for jumping out of the water. They are warm-blooded animals, with a body temperature of 40 ˚C, and they have thick layers of fat that repel water and insulate them from the cold. A thick layer of feathers helps them conserve heat by trapping air, which is kept warm by their own body heat. The bubbles you can see when they dive come from this warm air. Penguins spend most of their time in groups known as colonies, coming back to them from the ocean every year in order to breed. When they meet their mate, they face each other with their beaks pointing skywards and their flippers pointing behind them. They make croaking sounds which are individual to each penguin and help them to find each other in the colony. They are oviparous, like all other birds. Every year, penguins begin a journey to their place of birth, where they carefully lay their eggs. Usually, the female lays two eggs at the beginning of October, which take around 40 days to hatch. In general, only one of the chicks survives. The parents take turns to protect the chicks, while the other goes back to the sea to feed. 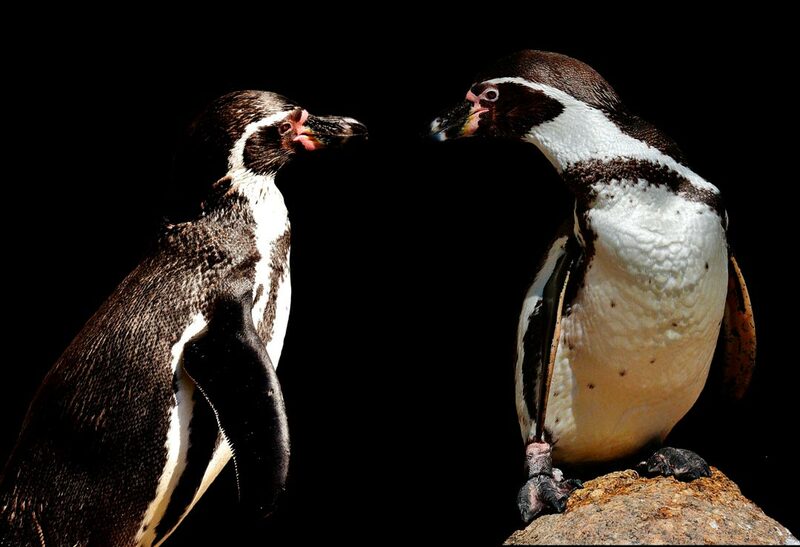 With most penguins, the male and the female build a nest far from the water, under bushes, in caves or in open spaces. In some cases, where they are unable to build a nest, they keep the egg on their feet for around 6 weeks. A fold of skin on their belly covers the egg or the chick, protecting it and keeping it warm. The chicks have no feathers when they hatch out, so they stay in the nest until they develop a first layer of very fine feathers, or down, which protects them from the cold. When they go fishing, for example, some adults look after the chicks while the rest go fishing as a group. They feed on a variety of fish, squid and krill, as well as some small shrimp-like crustaceans that are found in plankton. Their bristly tongues help them to grip their prey, which they swallow whole, as they have no teeth. 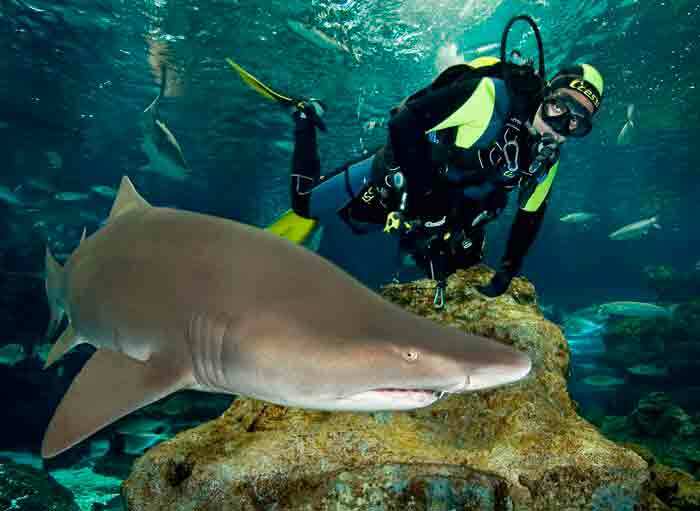 Their predators include leopard seals, petrels, killer whales and sharks. The 17 species of penguins in existence all live in the southern hemisphere, but contrary to popular belief, not all of them live in cold climates. 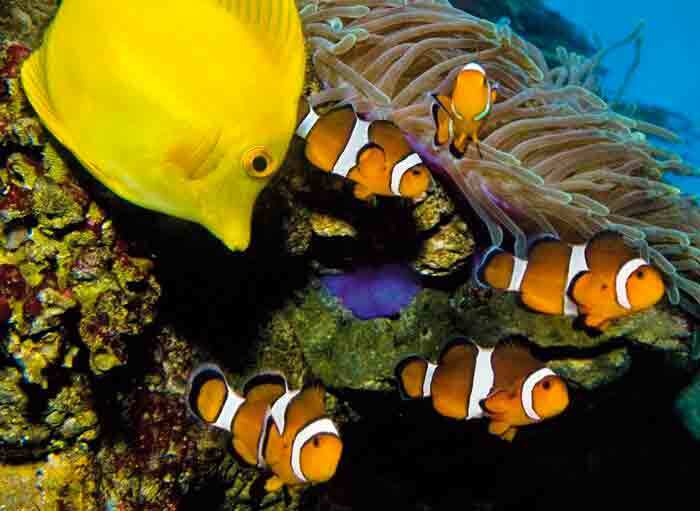 Most species live in temperate or tropical climates, but in areas where the water is cold. They are the biggest of all penguins (1.2 m tall and weighing 30 kg on average) and can live for over 20 years. They only live in the Antarctic, forming colonies of hundreds of thousands of individuals. In the past, they were slaughtered for their fat and skin, although the inaccessibility of the Antarctic region has helped to conserve them. 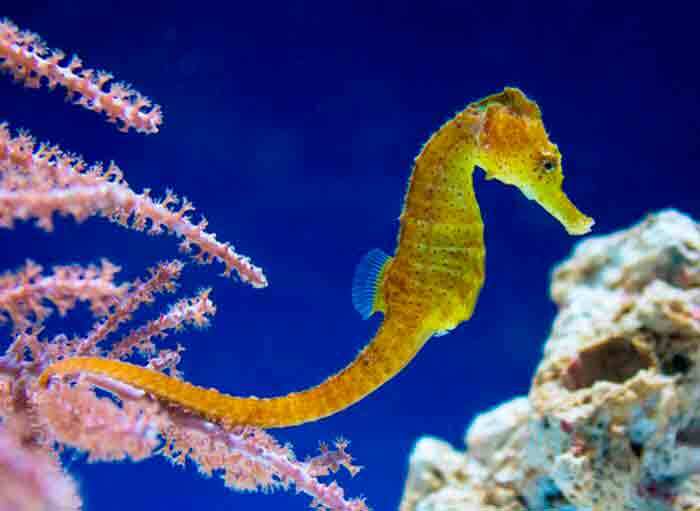 They are great swimmers, able to dive to depths of up to 500 m, at speeds of between 6 and 9 km per hour. They can remain underwater for up to 20 minutes without breathing. In the breeding season, they travel 90 km inland, a long journey that begins in April, when temperatures can reach 40˚C below zero. They seek a mate by performing courtship displays: raising their flippers and bowing. In May or June, the female lays one egg, which the male keeps in his abdominal pouch (it mustn’t touch the ground at any time, because that would be fatal for the embryo) while the female goes hunting for food in the sea. The males form compact groups to protect themselves from the cold and the wind, and after two months, the females return and feed the chick, regurgitating the food. It is then the male’s turn to go and hunt for food. When he returns, both parents look after the chick together. When they become independent, the chicks imitate the behaviour of their parents, forming small groups with other chicks. They are a monogamous species and reach sexual maturity at the age of 5. They have blue plumage on their back. As their name suggests, they are the smallest of all penguins (45 cm long and weighing a maximum of 1.1 Kg). They are native to the seas of Southern Australia and New Zealand. This is a gregarious species, natural to the Humboldt marine currents, with a distribution ranging from the central Peruvian coast to the central Chilean coast. The species is endangered, with a total population of only 12,000 individuals, because the fluctuations caused by “El Niño” and “La Niña” affect the water temperature of those currents. 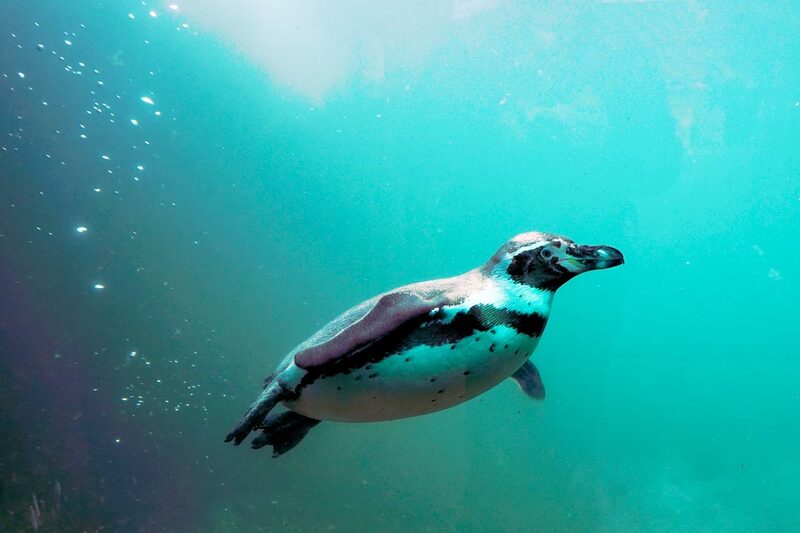 On average, Humboldt penguins weigh between 3 and 5 Kg. They live in breeding colonies on the coasts of cold and temperate regions in the southern hemisphere. At night, they usually sleep inside burrows, although some penguins choose to stay outside and may sleep upright or on their sides. L’Aquàrium de Barcelona has a colony of 21 individuals and to date, 12 chicks have hatched. The breeding season starts in March and they can breed twice a year. They lay clutches of two eggs that are incubated for 40 days. The chicks don’t leave the nest until they are 2 months old. Some pairs stay together for 2 or more years, although others prefer to change partner every year. Young penguins have a silver-coloured belly. Once a year, the penguins moult their feathers, and during this period of change, which takes about a week, they look a little scruffier than usual. Penguins often rub their beaks over their bodies, because they have a gland at the base of their tails that secretes an oil which makes their feathers impermeable; this behaviour is known as grooming. The keepers feed the penguins individually, twice a day, although the food is sometimes thrown into the water, so that they have to dive to get it. They feed on herring, sprats and similar fish.